This week I feel like something exploded inside me, and I'm making things that I've thought of before, but never got to doing. Maybe all that letting it sit and perk inside me has come to fruition? 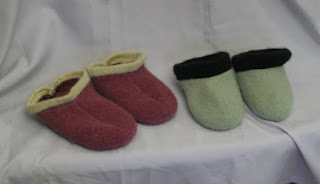 So anyway, here are some more slippers. 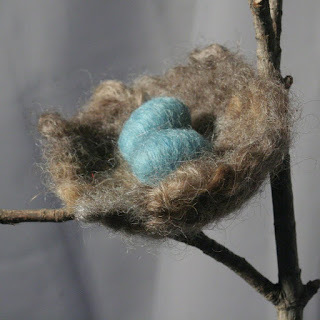 I'm still experimenting around with weights and feltedness of sweaters before I put the slippers in to wash/felt. These came out a lot smaller lengthwise, and wider than I had hoped. 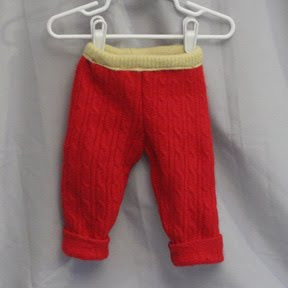 I've had a number of visitors to my booth suggest that I make wool longies for babies and little ones. For some reason (like I couldn't figure out how to do it from sleeves the way they said) I haven't tried. Amazingly (lol) I was able to find instructions - easy ones- on the internet. Who'd'a thunk? So here's my first try. The red ones are made from sleeves. 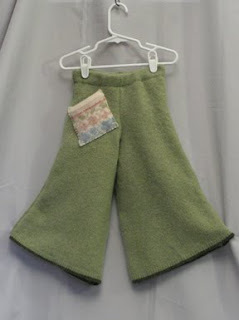 This green pair is made from the body of the sweater and I like how they came out funkily wide-legged. Some hippy child will probably like them! 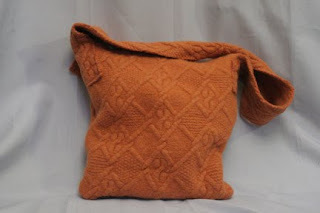 Next is a bag from an amazing sweater. I had to buy this sweater, the cable pattern was so awesome. 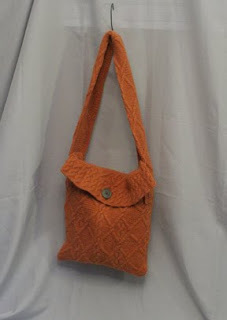 And I knew it would become a bag. It didn't come out as wonderfully as I had pictured, but I'm happy enough with it. Here's a closer view so you can see the pattern. 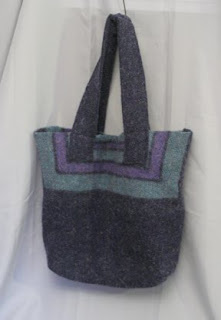 Next is a market bag made from a sweater that felted up realy thick and sturdy, yet big enough to make a big bag. That's a happy thing. 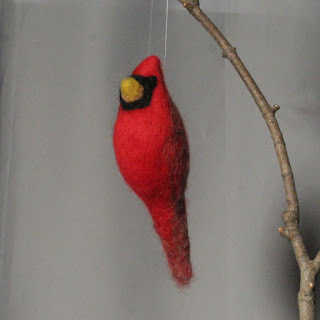 I've also done a little needlefelting, too. Today I'm off to the Billings Forge market, and I need to label all this stuff. Saturday is NOFA's Winter Conference - really looking forward to that!